Kristi Pinderi, LGBT activist from Albania, is one of the human rights defenders included in the Natalia Project. Kristi Pinderi, LGBT activist from Albania, is one of the first human rights defenders from the Western Balkans to be included in the Natalia Project security system. 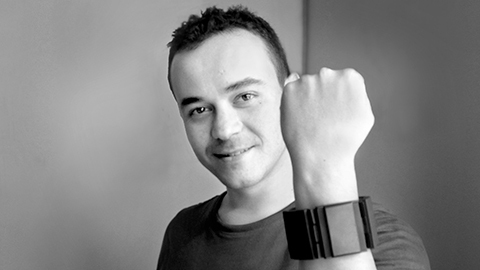 His bracelet was activated just in time for his participation at Belgrade Pride. In his work, Kristi Pinderi is constantly exposed to hate speech, threats and the risk of violent attacks. Being the Executive Director of the organisation ProLGBT, he has been instrumental in raising the visibility of the gay movement in the country. He was also an integral part of the working group that helped draft the first ever anti discrimination legislation in Albania, which came into force in 2010. Marie Månson, Director for the programme Support to human rights defenders at risk, is pleased that the Natalia Project has been expanded to include human rights defenders at risk in the Western Balkans. Within the next few weeks two more human rights defenders from the Western Balkans will be included in the Natalia Project. That will make a total of nine participants. The previous six people are all from the North Caucasus. Preparations have started to add defenders from Southeast Asia within the next months. The goal is to expand this number to 55 by the end of 2014.